Like most colorblind people, a colorblind Microsoft engineer wanted to be able to distinguish colors better and to get an idea of what the rest of the world saw. To help him do that, he worked with another Microsoft software engineer to create a new app. Called Color Binoculars, the app is iOS only at this point so I haven't really given it a shot yet. I'll have to dig out my cranky old iPad and see how it works on that so I can update this with my impressions. The app has selections for the most common types of colorblindness and enhances color differences to help colorblind users differentiate colors. It's like a digital approach to what the EnChroma glasses are supposed to do. For now I wanted to put this out there and get more attention on it in case others might find it useful. You can find out more about it on the Microsoft Blog. According to Google it's a color filter that partially colorblind users can customize and use to improve color perception. At least for me, I'm not sure it's doing much, but I am also finding the calibration routine it wants you to go through is fiddly and unreliable for me. Could my wide gamut displays be messing with it? I don't know, but I'm going to try it on another machine/screen tomorrow. It may work for some though, and it's a nice idea. There are similar programs out there designed to enhance color perception of images, and a browser plugin is a logical extension of the concept. Accessibility options for programs to help colorblind users are not as common as they could be, and the web doesn't always design with the colorblind user in mind either. Try it out for yourself, maybe it'll be helpful for you! Valspar has teamed up with EnChroma to produce this short video. It shows people supposedly seeing colors for the first time thanks to the EnChroma glasses. EnChroma has a more technical breakdown of how their glasses supposedly work, although it's a notch filtering system that purports to help users differentiate colors by blocking wavelengths that the cone's photopigments overlap on. While the actual effectiveness of these glasses is not really proven, and I remain skeptical, there are claims that they have helped some deuteranomalous and protanomalous users. Regardless, it would be fun to try them myself some day, videos like this certainly make me wonder what (if anything) I might be missing. I was recently asked by someone with a poor sense of smell and taste how horseradish tasted. How do you answer that? If he suddenly regained his taste I'm sure it would be much like if I could suddenly identify and see all colors, some things might make more sense and certain expressions that many take for granted would suddenly have meaning. My color blindness is certainly not as bad as it gets so I imagine the effect would be even more profound for those who are more strongly affected. For more on the project check out the Valspar Color For All site. Is the dress blue and black or white and gold? Is it something else? It raises some interesting questions because nobody seems to be sure why we're asking yet. I was recently contacted by the creator of the short film "No Such Thing As Color." In it she features a colorblind musician named Evans Forde as he tries to identify the color of things and explains how colorblindness affects him and how he understands the concept of color and its perception. In some scenes Laura processes the colors to simulate colorblindness for 'color normal' viewers of her video. It's a great 9 minute look at how colorblindness can affect someone and really touches on how it can feel to be colorblind. At one point Evans is looking at a house trying to decide what color it is and he says "I just don't know." I understand everything about that frustration! To me it's really interesting to think about how other people look at objects. Evans says he looks at an object and considers its shape, texture and any other attributes except its color. If I know what an object is I assign it the color it should be for a normal observer but if I don't I might consider how warm or cool it is, its 'ish-ness (reddish, blueish, yellowish) or if it appears more or less saturated. Perhaps that comes from my interest in visual arts such as photography. Color can be an important element so maybe I've trained myself to try to be aware of it, as best I can. With his background in music Evans tries to relate colorblindness to being tone deaf which is an interesting comparison (since I'm not really tone deaf) and one I'll probably be rolling around in my head for a while! This video has made me ask myself people who can see color without difficulty look at and consider the color before everything else or whether it depends on what they look at? Perception is a complicated thing and how much of our color perception is learned, such as when he talks about the red apple, is something I have heard asked many times (and is perhaps something worth going in to at a later date). It's hard to imagine what perceiving colors must be like for the color normal yet at the same time you get used to how you see the world and don't even think twice about it most of the time. I have to point out that she brilliantly includes a clothes shopping scene, every colorblind person's worst enemy! Matching colors is NOT our forte. You can check out the site for the short film here or click through the video to its YouTube page. Since beginning this site I've always found it interesting to see what search queries drive some of the visitors to this site. Just the other day someone came here having searched for an answer to the question "do colourblind people see grass orange?" An interesting question, and one that doesn't have as simple and straightforward an answer as most might think. As Daniel points out on his site, he wouldn't be able to see an orange laying in grass. Does that mean he sees the grass as orange, or the orange as green? I'm sure people could argue over this for a long time but in some ways it's neither. As with anyone, when a colorblind person is a kid they learn the colors of common objects which serve as reference points. Grass is green, oranges are orange and the sky is blue are some common examples. 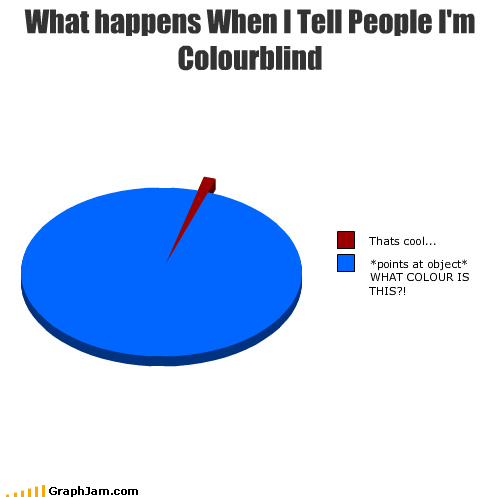 Whether a colorblind person has trouble with those colors or not, they will still know what color those things are. Color names are just words used to describe a particular range of spectral properties. Something that is blue reflects more light in the shorter wavelengths whereas a red object reflects more light at longer wavelengths than it does at medium or short. While it may seem like an arbitrary system we've all been taught to apply the same names to the same things which means that barring any color vision or cognitive issues, you should be able to identify most things the same way as other people. The problem I run in to is that sometimes I can look at something and I don't even know where to begin to try identifying the color! In the soft pastel greens, peaches and skin tones everything starts to blend together making it pretty much impossible to identify a color without any sort of contextual information. This sort of problem is also exactly why I came up with the term blurple. Vision is a complicated system relying on the eyes and the brain and since the concept of color is a perceptual property of the human visual system I wouldn't say that a colorblind person sees the grass as orange. They may not be able to distinguish the green of the grass from something that is orange, but they know the grass is green and the orange would just happen to blend in for them, such as in David's case. If you showed him a colored patches that match grass and oranges in color he wouldn't be able to identify them but given the context of "this is an orange on a field of grass" he would "see" the colors. Sometimes I would describe it as though there's a big tool tip hovering over things labeling the colors as I identify common objects and tell myself what color they should be. Maybe David sees "GREEN" in bold hovering over every lawn he sees, hopefully he uses a nice font. I had been thinking about sharing some of the more amusing search queries that have driven traffic to this site in the past, but I don't think I've put any thought towards that in the past year or so now. This post will likely be the first of a never-ending series of posts that respond to more interesting (or amusing) search queries. Software for the colorblind: eyePilot works in Windows 7! Since switching over to Windows 7 I hadn't thought to see whether I could get eyePilot to work. I never succeeded with Vista, even with the compatibility modes and everything else. A week ago I was playing on my laptop (while writing the previous post) and decided to try installing it and was surprised to see it working. Today I installed it on my desktop to verify that it wasn't a one-time fluke. Success! It works in Windows 7 without any need for compatibility mode or being run as administrator. It isn't 100% perfect (and those things don't fix it), but considering they may never update/release a new version (or may never do it in our lifetime) this at least gets it running and doing what I need it to do! While I'd still love to see EyePilot updated and useful since it offers a host of handy features, its creators seem to be content to sit on their duffs ignoring the world while claiming they are working on an update (they are still "working on a Vista compatible version" supposedly... riiiiight). Until they (or more likely someone else) step up to the plate I am not currently aware of any other programs with the features EyePilot sported however that doesn't mean there aren't plenty of other little helpful programs. Random web searching brought me across a nice little program called Colorblind Assistant which is in many ways an updated looking WhatColor which I have covered previously. Feature wise they're basically identical so take your pick. Both will give you a standardized name for the color under your cursor, as well as read out color data and provide a zoom of the area immediately around your cursor. Both are built for Windows and will run on basically any version of said platform and require very little in the way of resources. The Colorblind Assistant application is about twice the size of WhatColor but both are under a megabyte and will sit unobtrusively on your desktop reading out color data to you if you choose to leave them running. Although WhatColor would like you to pay $8 to register it (it's a "fully functional evaluation copy" distributed as shareware), Colorblind Assistant is completely free. So if you are cheap and have moral pangs over not paying for WhatColor, Colorblind Assistant will leave you with a clear conscience. The flexibility of the iPhone platform is allowing for a broad variety of tools to be developed for it which intend to address issues of interest for colorblind people such as myself. While I still don't own an iPhone (and don't intend to get one), this is another tool that can identify colors, simulate color blindness and provide color matching and coordination features. HueVue performs a number of handy functions with an a easy to use interface. It can identify colors as well as try to alter colors to simulate colorblindness or compensate for the colorblind user. While those features are nice and not that uncommon it also has some unique features designed to assist with color coordination and color matching. Overall, if you're looking for a utility like this for your iPhone HueVue is another one worth considering. To learn more about HueVue's wealth of features and its creator I'd definitely recommend checking out the HueVue website.